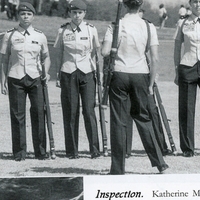 Lyman High School's Girls Junior Reserve Officers' Training Corps (JROTC) during inspection led by Katherine Mendelson in 1998. The Junior Reserve Officers' Training Corps (JROTC) is a high school-level education program sponsored by the United States Armed Forces. The program was created by Army Lieutenant Edgar Steevers in 1911 and officially established by the National Defense Act of 1916. The act provided high schools with loans of federal military equipment and assigned active or retired military personnel as instructors. Original black and white photograph, 1998. Print reproduction of original black and white photograph, 1998: Greyhound 1999, (Longwood, FL: Lyman High School, 1999): Seminole County Public Schools Collection, UCF Public History Center, Sanford, Florida. "Lyman High School JROTC." Lyman High School JROTC. http://lhsjrotc.webs.com/. "Marine Corps JROTC." Marine Junior Reserve Officers Training Corps, United States Marine Corps, United States Armed Forces. www.mcjrotc.org/‎. "NJROTC: Navy Junior Reserve Officers Training Corps." Navy Junior Reserve Officers Training Corps, United States Navy, United States Armed Forces. http://www.njrotc.navy.mil/. "JROTC Today." Army Junior Reserve Officers Training Corps, United States Army, United States Armed Forces. http://www.usarmyjrotc.com/. Greyhound Staff of 1999. 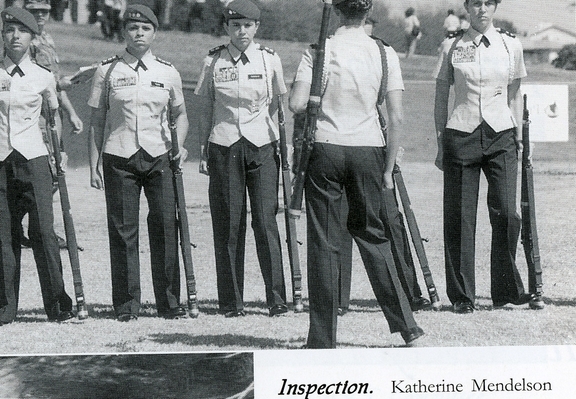 “Lyman High School Girls Junior Reserve Officers' Training Corps.” RICHES of Central Florida accessed April 21, 2019, https://richesmi.cah.ucf.edu/omeka/items/show/2819.